That then is the secret: a system built around a specific type of player and a type of players that make the system work. The starting point, however, is to have an idea on how the team should be playing. "For me, it’s the basic," says Jordi Pascual a Catalan coach who has written books about the Spanish style of play. 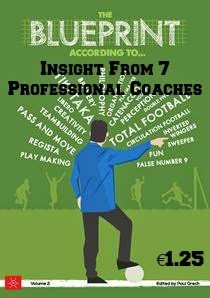 "If a coach doesn’t have a very clear idea about how his team is going to play, how can he prepare the activities when training? What is he going to say to the players? Of course, it’s clear that you have to know the players that you have, as not all them can play the same way. But it’s not “this” or “that” style. It’s to have “A” style, no matter which one." Pascual is a coaching veteran with the current one being his 24th season as a coach. "I started coaching when Johan Cruyff arrived at FC Barcelona. So, the “Dream Team” and the “possession style” is the biggest influence I have had," he says. What he has learned, he is trying to share through his books. "It’s about developing a way of playing," is how he describes his latest contribution Developing a Style of Play. "That means that from the moment you choose a style (whatever it is: possession, counter, direct, etc. ), with the formation used, roles and responsibilities of players and the way of training it. I’m always going on that the training has to be according how you play. This means that the exercises, activities, drills have to be prepared accordingly. Train as you play." As the Spanish experience highlights, it is not simply a case of deciding a set way of playing and enforcing it on players. 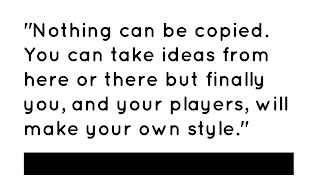 "The most normal thing is to look for players that fit to the idea (style), but you’ll have to adapt. More or less, but you’ll have to do it." 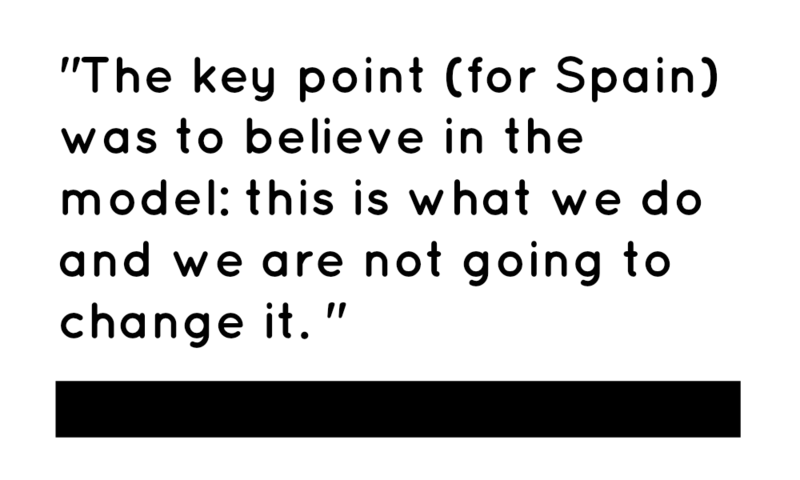 This also requires flexibility so that systems can be change when new players come it. "You always have the “big picture” in mind but at the same time adapting it to the new players you have. Not all wingers are the same, as not all central midfielders or players in whatever position. So, you have to adapt." Nor is it possible to simply copy what the Spanish or the Germans are doing. "Nothing can be copied," Pascual confirms. 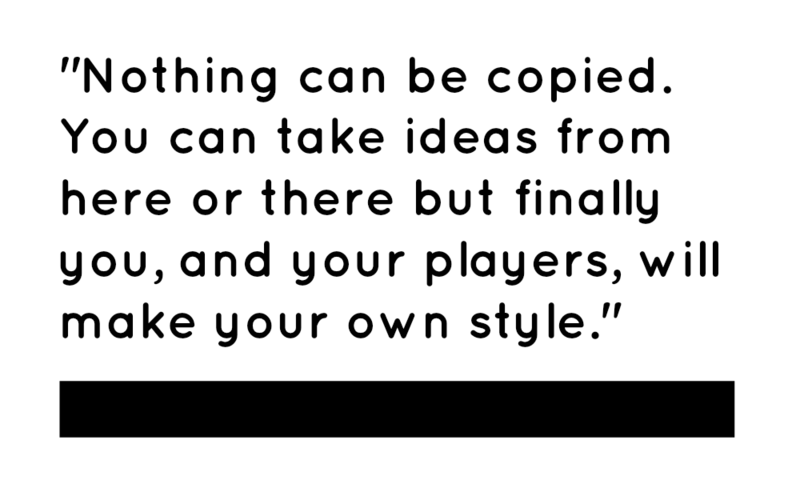 "You can take ideas from here or there but finally you, and your players, of course, will make an “own” style. It can be similar to this or that but it won’t be the same as any other. Always we - all of us - have to adapt to what we have." Adapting and realising what their way of playing was certainly helped the Spanish evolve from the historical failings of the Furia Roja (Red Fury) to the success of tiki-taka. 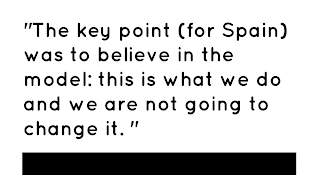 "I think that the key point was to believe in the model: “this is what we do and we are not going to change it”. Add to this some players incredibly gifted to play football plus some coaches not being afraid to put young players in the squads and, probably, you’ll have the answer." As Pascual noted, it helped that Spain began developing some fantastic players. "I suppose it has something with the players," he says as he tries to determine how come so many creatively brilliant players emerged. "Spanish people are, in general, smaller than in other countries of Europe so, they have to use the “weapons” that they have: ability, gamesmanship, etc. Also, football has been played for many years in the street. But, of course, I think there are many different aspects, as can be good coaching or the classical 'latin improvisation'"
What is certain is the lack of attention devoted to the physical strength of players. "What importance do I give it? None. Football is a global concept. This means that you can’t separate technique, tactics or the physical. All go together and must be trained together. You play football, so you have to train football. In this aspect, I’m a big fan of Mourinho when he says that a pianist doesn’t do laps around the piano for warm-up, so, why should football players have to run laps around the pitch?" Jordi Pascual holds UEFA “B” and UEFA “A” licenses, together with a “Monitor Course” (similar level to UEFA “C”) awarded by the Catalan FA. He also holds a Degree and Masters in Management of Clubs attained at a private coaching school in Barcelona. 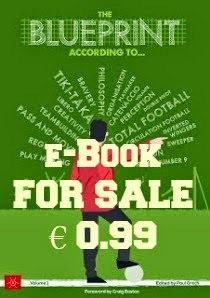 He is also the author of two books Coaching Spanish Soccer and Developing a Style of Play as well as writing on his blog Football Pirineus. Have you signed up for Blueprint for Football Extra yet? Do Great Players Make Great Coaches?